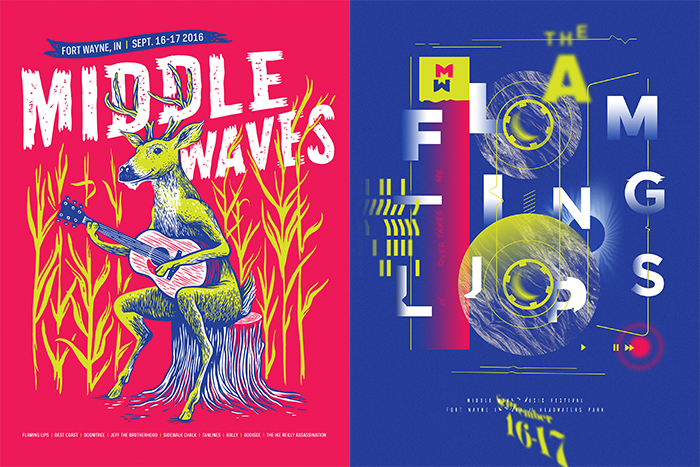 Art director Adam Johnson and senior graphic designer John Ilang-ilang were recently approached to design posters for a new music festival in their hometown. Middle Waves Musical Festival took place September 16 and 17 in Fort Wayne, and Adam and John’s posters were displayed in a gallery show the night before the festival started. Their work was featured alongside posters from celebrity designers including Aaron Draplin, Nate Utesch, Dan Christoffernson, Dan Cassaro, and Jennifer and Amy Hood. Each poster in the show used the same color palette and measured 18×24”, but the subject could be anything related to Middle Waves. With such a strong lineup, it wasn’t hard to get inspired.